This week in 1813 the United States government adopted the nickname “Uncle Sam.” Samuel Wilson, a meat packer in Troy, NY stamped barrels of supplies sent to soldiers in the War of 1812 “US.” The soldiers began calling the supplies “Uncle Sam’s.” In 1860 American cartoonist Thomas Nast popularized the white-bearded, stars-and-stripes clad figure we know today. 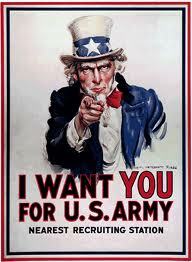 During World War I, James Montgomery Flagg used his own likeness to create Uncle Sam, adding age and the white goatee to create the iconic recruitment poster. The poster was reissued in World War II.